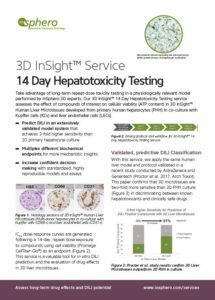 3D InSight™ 14 Day Hepatotoxicity Testing assesses the effect of compounds on cellular viability in our standardized 3D InSight™ Human Liver Microtissues, developed from primary human hepatocytes in co-culture with Kupffer cells and liver endothelial cells (LECs). 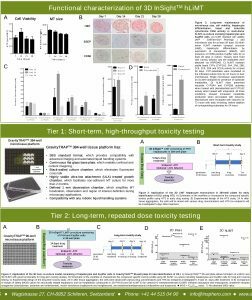 Cell viability dose-response curves are determined following a 14-day, repeat dose exposure to compounds. High reproducibility between independent experiments and Human Liver Microtissue co-cultures of A: different NPC lots and B: hepatocyte lots (1). 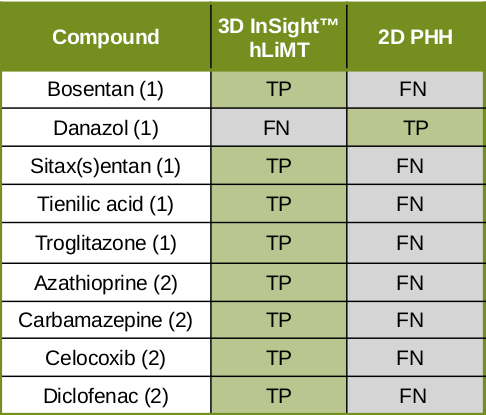 High sensitivity of 3D InSight™ Human Liver Microtissues in identifying hepatotoxic compounds (DILI category 1-3) after 14-day treatment. 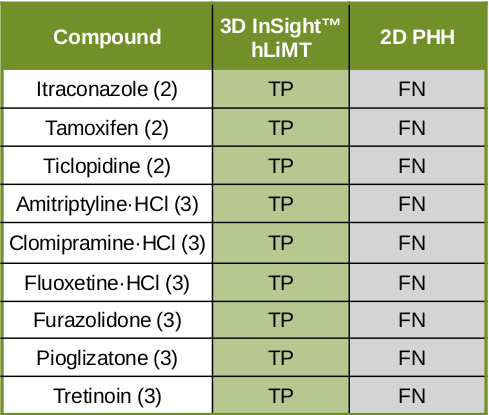 Green: compounds predicted as True Positive (TP); light gray: compounds predicted as False Negative (FN). Prediction based on arbitrary MOS.